A raft of non-runners on account of the fast ground reduced the field to just four runners, but racegoers were still treated to a fantastic contest. Road To Respect was favourite for the race before the likes of Al Boum Photo and Monalee were taken out and was eventually sent off at odds of 5-6. Sean Flanagan on Road To Respect was content to get a lead off the Ruby Walsh-ridden Bellshill on the first circuit, with the two Gordon Elliott runners, The Storyteller and Outlander, following. Just after halfway Flanagan kicked into the lead but while he tried to break away, Road To Respect lost ground to his main rival at several fences down the back straight. Nevertheless, a big leap at the last appeared to give Road To Respect the advantage as Bellshill (2-1) did not start gaining ground on him until the final 100 yards. The gap closed with every stride and Walsh was in overdrive as the pair crossed the line together, with Bellshill getting the verdict in the photo finish. Mullins said: “He jumped brilliant and Ruby was great on him. We’re very keen to take him to Cheltenham, he needed the run badly at Christmas. “Ruby was fantastic. We didn’t want a slow pace and he didn’t think there was much pace in the race so he elected to make it. “Then when Sean went by him, Ruby was happy to sit there. What I really liked about the horse was that every time Ruby wanted a jump, he took two lengths out of the one in front. “He knew he had that in hand and he was very confident and cool over the last three fences, I thought. “He used the other horse as a lead. I thought he might pull out more after the last, but he pulled out enough. “A lot of horses didn’t turn up, but still the quality horses were here and they served up a fantastic race. “We might have a few nice horses to go to Cheltenham with this year. “He’s always promised to be this good. 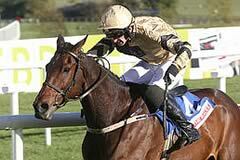 Now he’s won his Irish Gold Cup and hopefully we’ll follow on, maybe, next month.